A burglar is today behind bars after picking the wrong house to burgle. 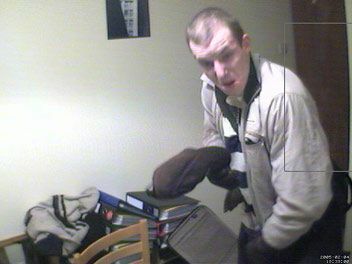 His crime was caught in full by a webcam, which the hapless thief stole along with the computer, but not before it had sent pictures of him to a website. Still, at least he doesn’t look really gormless…oh, hang on. 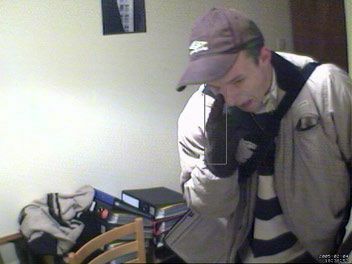 You’ll note as an observance of tradition he has opted for the time-honoured burglar uniform of a striped jersey and swag bag – just to make it really obvious what he’s up to. I’m sure Umbro are delighted with the chavtastic publicity. This 356th post was filed under: Technology. Comment posted at 23:40 on 17th November 2006. Brilliant! Just what I need for the burglar alarm topic I’m doing at school. Did his bag have ‘SWAG’ written on it too? I’d love to know what the court thought of these pics! Comment posted at 12:19 on 18th November 2006.